Over a year ago I needed to replace my 2001 Audi S4’s front speakers because the driver’s side had gone all kazoo on me. You know that paper buzzing noise when a speaker dies. It probably bothers me more than it bothers most people but it drives me bonkers. Like a fly buzzing around my head. And when I did that replacement, I discovered that the premium system original equipment Bose speakers were actually paper cone speakers with traditional construction. And I discovered then that the speakers in this car were frequently failing in this way with a number of people complaining about them and finding ways to replace them. So it wasn’t at all surprising when the rear door speakers started making the kazoo noise too. Again, the time when it was most prevalent was on AM newsradio, not on what I would thought would be more challenging metal music. But as I have come to learn, AM newsradio is actually pretty challenging because it’s all boomy lower midrange – exactly the sweet spot for the Bose speakers. This time, however, I thought about just disconnecting the speaker and walking away. Unlike the front door speakers which along with the small tweeter near the door handle are responsible for the sound for the front seat area, the back seat area has both the rear door speakers and the rear deck speakers. And not only are the rear deck speakers bigger than the rear door speakers but the rear deck speakers fire up towards the glass with sound reflections filling the car whereas the rear door speakers fire at the rear passenger’s feet with seemingly little sound radiating out of the footwell area. On the other hand, the buzzy noise was pretty easy to hear so maybe it was worth replacing. And now that I know what speakers worked for the front of the car, all I would need to do is get the same brand in the appropriate size. I returned to the Audi zine/posts/forum to figure out which size would work. I also checked Crutchfield. The front door size was clear: “4 inch”. But the rear size had some reports saying 3.5″, others saying 5.25″, and others saying 6.5″. So I removed the door panel to get a look at the existing speaker. (See below if you need tips on removing the door panel.) 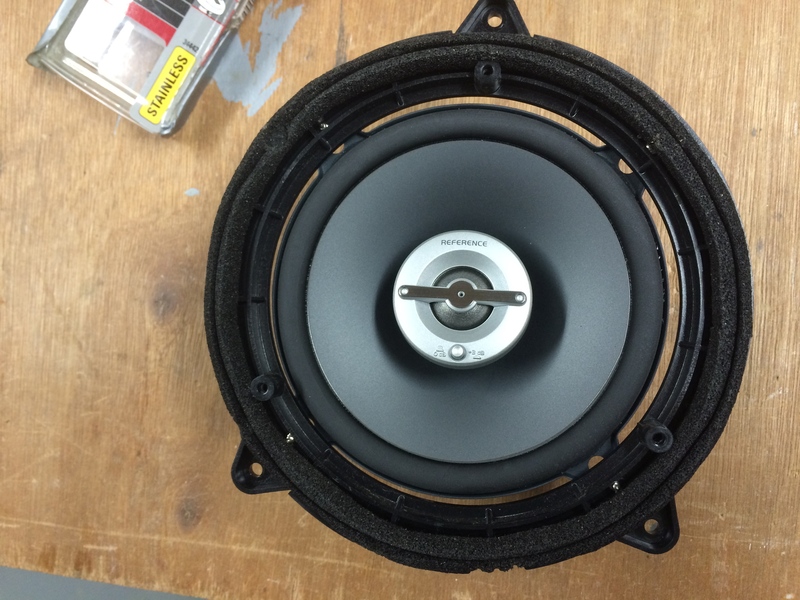 The existing speaker did seem to be 5.25″. But that speaker screwed into a ring that was more like 5.75″ in diameter and I’m not really sure where to measure diameter – is it the diameter of the cone or the diameter of the screw hole ring or the diameter of the exterior frame of the speaker? I found it was particularly tricky with the Infinity 5.25″ speakers because they were effectively frameless – looking at the face of the speaker, it looks like just the cone with some metal tabs sticking off of it. 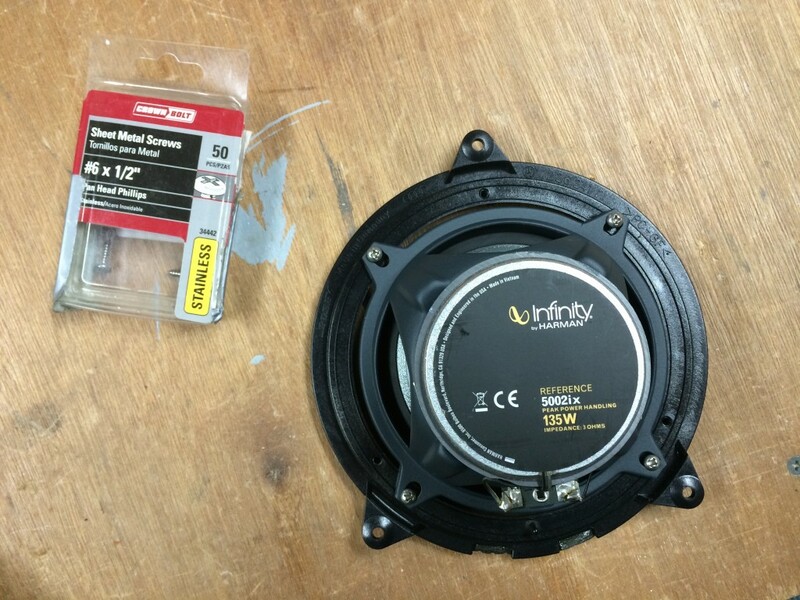 In the end, I decided to trust pzp107’s speaker replacement writeup and I ordered the 5.25″ Infinitys. I found them on eBay for $60 with free shipping. When the speakers arrived, the first thing I did was compare the mounting tab hole placement to the holes in the original speakers. 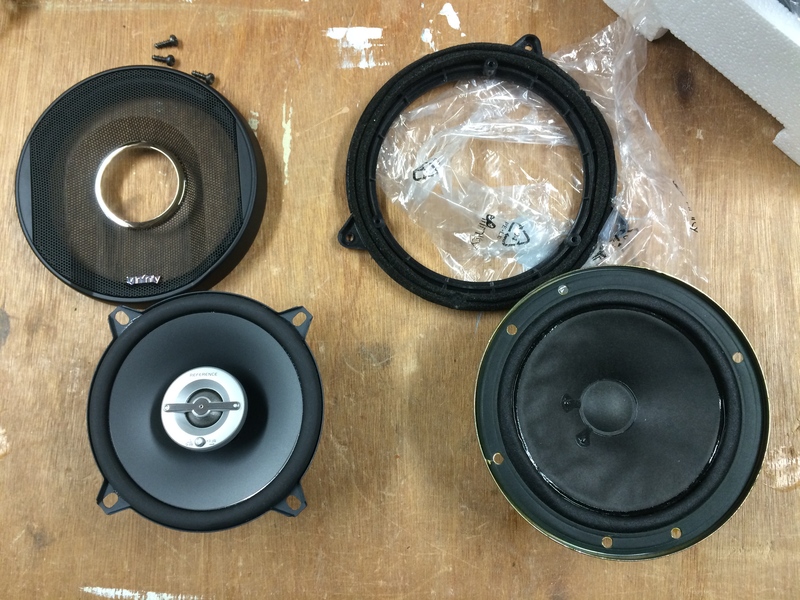 The diameter was a match – meaning that if mounting hole ring diameter would be about the same and I would be able to use the same method to attach the new speakers as the originals. In the picture above, you can see the new speaker on the left with the mounting tabs and if you measure across the middle to get the center point to center point of the mounting holes, you get about the same dimension as the original speaker on the right. Above the original speaker on the right is the ring that the original speaker mounted into. And that ring mounts into the door panel onto three pegs that are in an unusual pattern. It’s definitely going to be easiest to reuse the mounting ring than to figure out a different way to attach the speaker to those pegs. The only problem is that the original speaker mounted to the ring with three screws. You can see the hole pattern in the picture above is actually set up for either 4-hole mounting or 3-hole mounting. And interestingly, the ring has a little peg sticking up to go in an unused hole in the 4-hole arrangement. But the ring is not made of solid plastic and the only places where the ring is thick are the places with the 3-hole pattern. But I’m not going to let that stop me! The new speaker came with metal clips which I would have liked to have used but they don’t open wide enough to fit over this thick plastic ring. So I simply aligned the new speaker over the old ring and marked with an awl where the new holes would go. A couple of important points here: First, be sure that the speaker’s terminal block is at the bottom, centered above the ring’s little peg. Not only will that ensure that the terminals are near where the wire connections need to be but it will also make it so the inside tweeter points up to the passengers ears instead of towards their toes. Second, be sure to mark the screw locations on the outer range of what the speaker mount tab hole will allow. Not only will that help center the speaker, but that’s the right place to drill through the ring. For drilling, I used a 3/32″ bit and for screws, I used the ones in the picture above, #6 X 1/2″. Why stainless? Well, mostly because they are the ones I happened to have but I suppose ensuring that there’s no cheapo zinc screws in there to start rusting isn’t a bad thing either. I would have liked to have used the original speaker’s screws but there were only three of them so I would have needed to add one more from somewhere anyway. Now, in the picture above, you can see that the speaker is in place and well attached to the ring. But you can also see the main flaw in my setup and that is the gap between the speaker and the ring. Here’s the picture looking at the face where you can see that issue better. I probably could have done a little better job centering the speaker in the ring here too. Oh well. It’s fine. And as for the gap, well, it’s not ideal because theoretically, that changes the design from a sealed enclosure to an open enclosure. But car speakers need to be designed to handle a wide range of applications so the speaker will work fine regardless. And any idea I came up with to seal that gap just seemed like I’d be making more of a mess. Like using silicone could be a problem because of the lack of an extended frame on the speaker – the last thing I want is to mung up the new speaker with silicon leaking through from the back and the gap was just a bit too wide for me to risk it. Okay, once I made peace with the fact that there would be a gap, I installed the speaker in the door panel and reattached it using the same screws that held the ring in place in the original install. The speaker terminals were swapped from the original but that was as easy as removing a twist from the wire. The positive lug fit perfectly on the positive terminal spade – nice tight fit. The negative was way too loose. I needed to crimp it down to make it fit. With pliers I squished in the sides a bit and then squished down the edges too. I went slow to make sure I didn’t overdo it. In the end, the negative was a nice tight fit too. Reinstalling the door panel on to the door, however, turned out to be a problem. The new speaker is about one quarter inch deeper than the original. But the bigger problem is that the magnet and speaker basket is beefier on the new one. That leaves less room on the door for putting the door panel on high and sliding it down into place. If you look at the door with the door panel off, you can see that there’s a structural cross brace with a curved cut through it – that’s where the speaker bulk goes when you put the panel into place. Now, if you picture the original speaker having less bulk and they still needed to make that cut for it to fit, you can see where you’ll have a problem with the new one. I briefly thought about modifying the cross brace beyond what the factory had already but thought better of it when I realized that it might mean less protection in a crash. The solution is, I’m afraid, just brute force. As I was putting the panel on, I started with the hinge side and got the hooks into the door then I got the door lock peg through the hole and worked my way over to the latch side. By the time I got there the hinge side hooks had popped out. I repeated this a couple of times (what fun!) and knew I was getting close to getting it right when the area around the speaker started to bulge away from the door. Just a little more… and fwump… it settles into place. Granted, there may still be a hint of a bulge in the door panel but when you reattach the screw under the handle, everything is held in place tightly. The only downside is that if you take the door panel back off, you’ll notice that the foam that covers the back of the door panel is scarred a bit from where the magnet of the speaker pushed up against the door bracing and the magnet might show some scrapes too. Fortunately, there’s nothing fragile on the speaker on the top so the scratches are harmless. How’s the sound? Awesome! Very excited to not only get rid of the kazoo but also improve the overall speaker system in the car. Sample music this time was Linkin Park’s “Numb”. Not quite as old as the car, but it seemed appropriate to dig a little deeper for this test! The only question now: should I replace the rear deck speakers too? Just on the principle that the Inifinitys sound better than the original speakers where I have already replaced them? I think I’ll wait until warm weather to answer that question!